Avocados are considered one of the healthiest foods because of its high nutrient value. Most of the fruits mainly consists of carbohydrates, while avocados are high in healthy fats and low in sugar, which helps in reducing bad cholesterol and lowers heart diseases. Avocados are an excellent source of vitamins and dietary fiber. At first I didn't like the taste of avocado, but now I'm in love with this wonder fruit. Avocados add a creamy and rich texture to any dish. 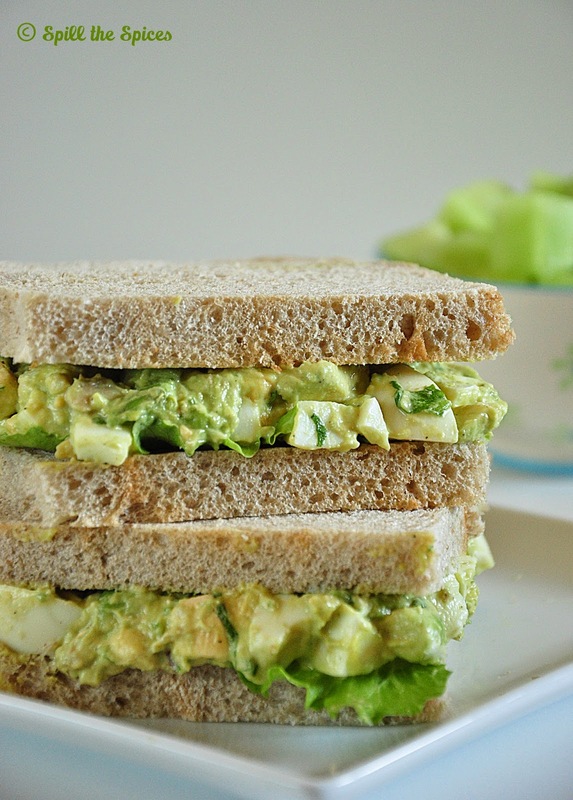 I make this avocado and egg salad sandwich often for breakfast. You can serve the salad alone as a side to roti or as a filling for wraps. 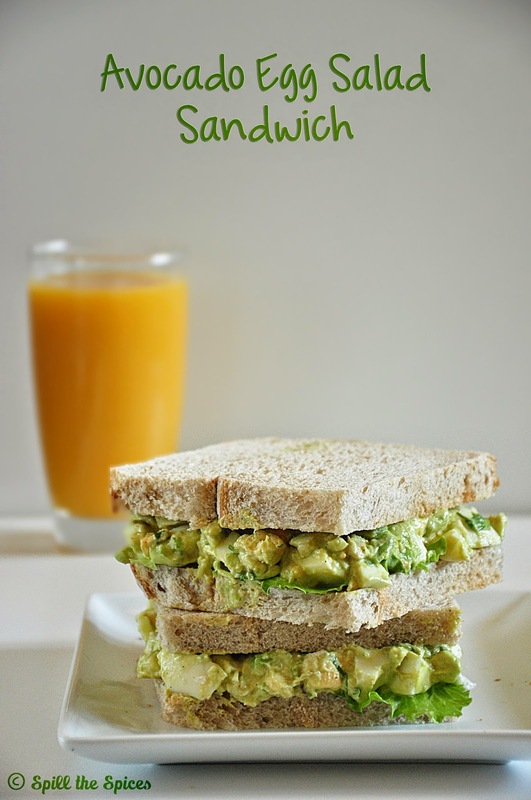 This sandwich along with a glass of fresh juice and bowl of fruits makes a healthy and filling breakfast. 1. Cut the avocado into half and remove the pit. Scoop out the flesh and cut them into small cubes. Cut the eggs into small cubes. Add them into a bowl and lightly mash them. 2. In a small bowl add mayonnaise, mustard sauce, lemon juice, coriander leaves, red chilly powder, salt and pepper. Whisk well. 3. Add this dressing to the avocado and egg mixture. Gently toss and mix well. 4. Remove the sides of the bread. Place lettuce leaves and then top it with 3-4 tablespoons of the avo-egg mixture. Put the other bread slice. You can use any mustard sauce. Adjust the quantity according to your taste. I have used American mustard sauce here which is slightly mild than Dijon mustard. You can also toast the bread lightly if you prefer. You can use this salad as a filling for wraps also. Top the salad with finely sliced onion and tomato. If you don't eat egg, you can skip the egg and make an avocado salad too. filling n healthy creamy one,would love to try this ! Beautiful pics. Sandwich looks fresh and delicious. Nice combo. sandwich looks delicious and inviting.. 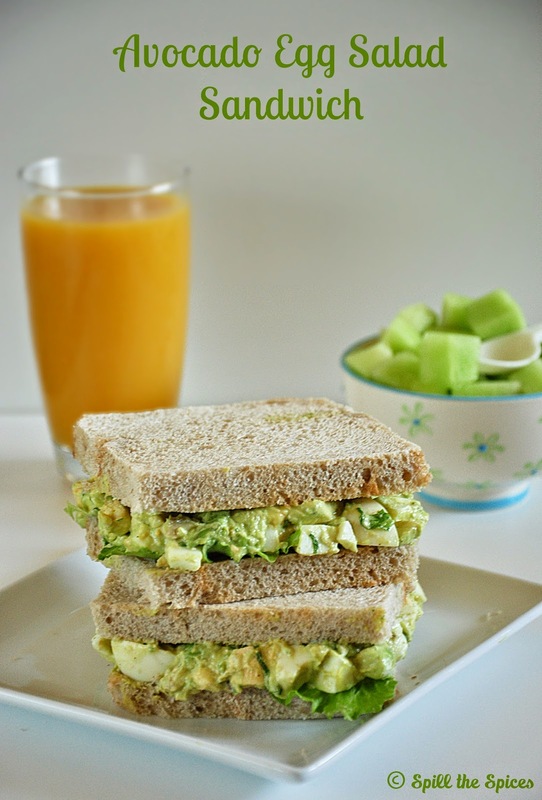 Perfectly made healthy egg salad sandwich. yummy sandwiches. would love to try sometime..